A lithograph of a buffy-crowned wood partridge (Dendrortyx leucophrys) from the Gould volume. The work was created by Victorian ornithologist and publisher John Gould and his wife Elizabeth. More than 70 watercolours of birds are included in the volume, of which 30 are preparatory drawings for Gould's celebrated publication The Birds of Australia (1840-48). The book was the first published comprehensive survey of Australian birds and included descriptions of 681 species, more than 300 of which were new to Western science. Arts Council England's Acceptance in Lieu scheme allocated the volume to the Museum. It joins five previously allocated volumes of natural history artworks to the Museum, which include further works by John Gould and his artist Henry Constantine Richter, as well as renowned eighteenth-century artists Sarah Stone, John Frederick Miller, Thomas Davies and Franz and Ferdinand Bauer. It represents the largest, most significant enhancement of the Museum's scientific art and illustration collection since 1937. All of the works hold historic, artistic and cultural significance and include paintings of great scientific interest. 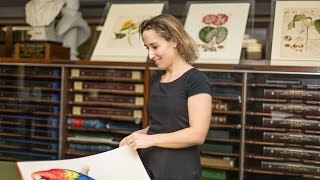 Andrea Hart, Library Special Collections Manager at the Museum, says, 'We're delighted to be allocated this unique and significant collection of watercolour drawings from such skilled and celebrated natural history artists further expanding the corpus of their works we already hold. 'Their beautiful and scientifically accurate depictions of birds, mammals and plants, including the very first illustrations of some species, offer a rare insight into an unparalleled period of scientific expedition and discovery. John Gould (1804-1881) described birds from all over the world during his long career. He was a taxidermist and an artist, and produced 15 major works and more than 300 scientific articles and small books. His work represents an invaluable contribution to ornithology in Britain in the nineteenth century. His wife, Elizabeth (1804-1841), was a gifted artist. She worked alongside him, producing illustrations and more than 600 lithographs (a type of print). She died in her late thirties, a year after the birth of their eighth child. John and Elizabeth published their first volumes together between 1830 and 1832, on the birds living in the Himalayas. Gould had described them using a collection of skins held by the Zoological Society of London, where he was a curator. He also worked with Charles Darwin in 1836, upon HMS Beagle's return to England. The naturalist brought specimens for Gould to catalogue, identify and name. An illustration of a pair of platypuses from The Mammals of Australia. Image via Wikimedia Commons. In 1838, John and Elizabeth left England for Australia to prepare a new book, and they spent two years there collecting hundreds of specimens and making drawings. On their return, Birds of Australia was published in 36 parts between 1840 and 1848, complete with a series of Elizabeth's coloured lithographs. It became a landmark in Victorian ornithology. John and Elizabeth went on to produce many more illustrated volumes, including studies of birds in Britain and Europe. John also employed a variety of other artists alongside his wife, who worked his sketches into finished lithographs. The ornithological illustrations join a volume of the original drawings for John Gould's Mammals of Australia (1845-63) which comprises 56 watercolour illustrations by Gould and Henry Constantine Richter. This volume includes many drawings of iconic Australian animals, most notably kangaroos, but also the extinct Tasmanian thylacine. One volume containing 56 watercolours and drawings by John Gould and Henry Constantine Richter, and 14 hand-coloured lithographic proofs, for Gould's A Monograph of the Macropodidae, or Family of Kangaroos (1841-42), and Gould's Mammals of Australia (1863). One volume containing 61 watercolours by brothers Ferdinand Bauer (1760-1826) and Franz Bauer (1758-1840) for Aylmer Bourke Lambert's A description of the genus Pinus. One volume of natural history illustrations by English illustrator John Frederick Miller (1745-1796) containing thirteen bodycolours of birds, mammals, lepidoptera and plants, and five watercolours of birds by William Lewin. One volume of artworks by British Army officer Thomas Davies (c.1737-1812) containing 230 watercolours and drawings. It includes 164 watercolours of birds, fish and snakes by Davies, 16 of birds, fish, mammals and flowers by John Frederick Miller, 12 of water birds by Francis Barlow (1626-1702), 10 of fossils, marine life and mammals by Sarah Stone (c.1760-1844), and others. One volume of illustrations by the early British natural history artist Sarah Stone (1760-1844). It contains 87 images, including 66 of birds, one of birds' eggs, six of fossils, pebbles, marble and limestone, three of lepidoptera, six of marine life, and five of mammals. One volume of bird illustrations by John and Elizabeth Gould. It contains 43 watercolours by John, 32 watercolours of birds by Elizabeth, three credited to both artists and one lithographic proof. Once their condition has been assessed and conservation work has been completed, the works will be made available for research and public engagement. The Natural History Museum's Library and Archives are of unparalleled artistic and scientific significance and include natural history literature, artwork, photographs, and current information resources, along with the institutional archive which traces the life and history of the Museum from its beginning to the current day. Ferdinand Bauer is regarded as one of the world's greatest natural history painters, and now his work is uniquely brought together for the first time.